Driving or riding in an automobile is a necessity not just a life style choice. There is no avoiding the risk presented by careless and negligent drivers, dangerous highway design, automobile design defects, airbag failure, or the negligence of liquor establishments that allow their customers to drink and drive. 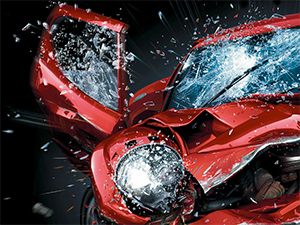 In America, 3 million people are injured in automobile accidents each year – that is one person injured every 10 seconds. Someone is killed in a car accident every 15 minutes, and the number of annual fatal car accidents is expected to rise 65% in the next 20 years. Three-quarters of the auto accident fatalities are male and automobile accidents are the number one cause of death for teenagers. Sooner or later you, a friend, or a loved one will likely be affected by an automobile accident. The decisions made after an auto accident will inevitably have a significant impact on the ultimate financial loss that ensues. Should you retain an attorney? This question arises from the misconception that an injured victim will ultimately receive less money by retaining and paying an attorney. In reality, the truth is that those people who do not retain an attorney invariably receive smaller settlement offers and ultimately recover significantly less money for their injuries and other damages than if they had retained an aggressive experienced car accident attorney. The insurance companies have aggressive professionals on their side whose sole objective is to eliminate and/or minimize the amount that the insurance company has to pay. Can you really afford to rely on their assessment of the situation? The legal professionals at the Law Offices of Roderick C. White have extensive experience successfully representing individuals injured in automobile accidents. Even if the auto accident involves an uninsured or under-insured driver, we may still be able to pursue compensation options through your own insurance company to ensure that you have the financial resources you need to deal with your injuries. Statistics show that two in ten drivers are uninsured which means you have a twenty percent chance of being struck and injured by a driver without insurance. Uninsured Motorist coverage pays bodily injury damages caused by an accident which the insured is legally entitled to recover from the owner or operator of an Uninsured Motor Vehicle. Under-Insured Motorist cases are even thornier. Under-Insured Motorist coverage is designed to step in if the responsible party does not have enough insurance coverage to compensate you for your injuries. If the negligent party is uninsured or under-insured, and you have this type of coverage, the role of your insurance company changes as you seek money from them. You become an adversary trying to get compensation for your injuries in a liability claim against your own insurance company. Your insurance company must step in and act as the insurance company for the uninsured or under-insured driver. An experienced and aggressive accident attorney is still necessary to protect your rights. Contact the legal professionals at the Law Offices of Roderick C. White as soon as possible after the accident. We will evaluate all available evidence and determine what else is needed. Don’t wait too long. Contact us immediately because valuable evidence tends to be more difficult to obtain as time passes. We will immediately contact the other driver’s insurance company and begin the complex process of securing the justice that you deserve.